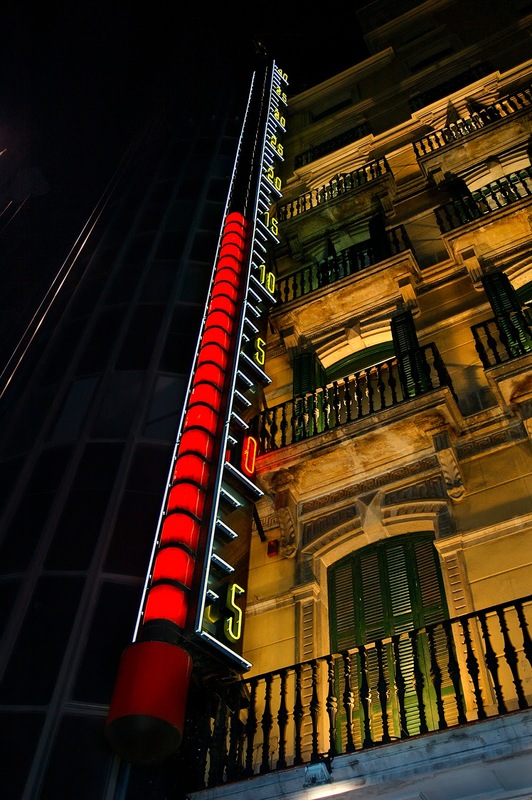 Back in 1956 a big thermometer was hung on the façade of Can Cottet building at Portal del Angel avenue (the most expensive street in Barcelona). It was customary in the fifties to boast about "new technologies" in public spaces. Cottet was a famous optician selling specs and shades and I still don't understand what the thermometer had to do with them. But before you leave maybe you would like to know the whole story about Can Cottet thermometer. The measuring instrument was designed by Rolando Cottet and was installed in 1955, but would not be operational until February 25, 1956. The project was carried out by the architect Pedro Ricard Biot. This thermometer is inspired by a similar luminous thermometer in Copenhagen. The thermal range of the thermometer goes from 5 degrees below zero to 40 degrees Celsius. The thermometer is placed 4 meters above the ground and rises up to 24 meters . The device weighs two tons. The Can Cottet thermometer has undergone some remodeling, but always trying to maintain the original external appearance. In 1998 it was renovated, taking advantage of the rehabilitation of the facade of the building. In 2009, its neon tubes were replaced by low-power led lamps. In July 2011 it was granted a "Little landscape of Barcelona" distinction by the Municipal Institute of Urban Landscape and Quality of Life. Carlos, meus parabéns, você consegue captar a beleza de Barcelona em cada foto sua. excelente imagem, muito bem conseguida. Very interesting story. I do like the angle from which you shot this. Just great picture! Well done! Thanks for the info! My sister and I were recently in Barcelona and found this thermometer amusing enough to take photos. Yours is the first photo I've seen with accompanying informal. Seeing your images I really wish I had thought to return for more shots after dark!